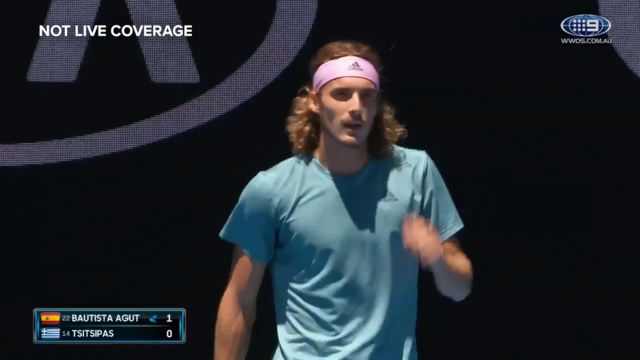 Stefanos Tsitsipas is not your average 20-year-old. That could be said about anyone of that age who beats Roger Federer, but not only is Tsitsipas fast becoming the leading tennis player of a new generation, he's also pushing boundaries off the court. A budding filmmaker, the young Greek has a You Tube channel with a fast growing subscriber base that is threatening to pass 100,000 as his profile swells during this Australian Open. While many people of his age, professional tennis players and otherwise, prefer to escape from reality by immersing themselves in video games or binging Netflix, Tsitsipas is all about the more natural wonders of the world, exploring the sights, sounds and smells of the cities and their surrounds that he's fortunate to be in the position to travel to. In many ways he's the opposite to Australia's own edgy, talented tennis star Nick Kyrgios, who has a penchant for Fortnite and whose contributions to social media are often inward with a focus on his place in the world rather than the world itself. It's a clash in personalities that has already taken a public platform, with Kyrgios responding to several tweets either by or featuring Tsitsipas. During the US Open last year the Aussie made headlines for responding to one abstract Tsitsipas tweet with the words: "Da fuq". He later deleted the tweet but Tsitsipas responded with thinly veiled contempt for Kyrgios' contribution. "Everybody knows who Kyrgios is, let’s be honest," Tsitsipas said in an interview. "I know some people see these things I do as something weird, writing all these tweets that make no sense. "It’s not sitting in my room playing video games, Fortnite like someone does. It’s better going outside and creating something rather than just sitting inside playing video games for the whole day, which I did before and now see no point in doing." No question he's creative, even if his work isn't everyone's cup of tea. The tweet Kyrgios snidely responded to said: "It's amazing of how many sounds you can hear while walking in NYC. Just close your eyes and absorb!" Tsitsipas' latest You Tube video was filmed in Perth and Rottnest Island and presents as a well researched mini-documentary on the curious animal that famously occupies the small West Australian outpost, the quokka. Competing in the Hopman Cup by day, Tsitsipas had clearly spent his downtime doing his homework, with the film titled 'This Island Has Something Extraordinary' a medium to educate and delight his legion of followers, attracting over 130,000 views. 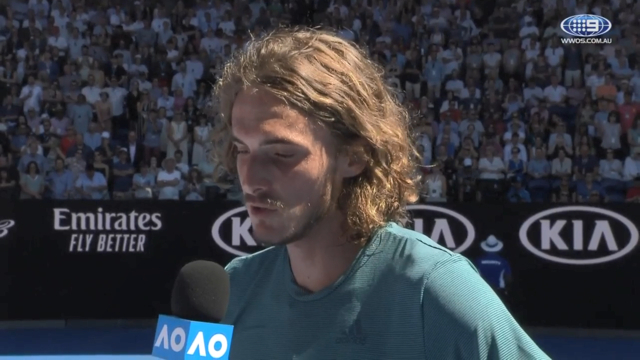 "We are planning to go to the Rottnest Island, with the quokkas who are smiling all the time," Tsitsipas starts. "It basically was called after the Dutch when they conquered, or when they first came to Australia, the Dutch not invented but were the founders of that island. "And there were many quokkas there that they thought were rats and that's why they called it Rottnest Island," he eloquently sums up. A confident young man, Tsitsipas has used his profile to spruik for more followers, requesting that fans subscribe to his You Tube channel in one of his on-court interviews with Jim Courier following a win that has him in the final four of a Grand Slam for the first time and in with a real shot of staking his claim for heir to the throne status when he meets Rafael Nadal in tonight's semi-final. Clearly he's ambitious but Tsitsipas is also humble and family oriented, with the Greek star generous in his introduction of every member of his entourage after his fighting quarter-final victory over Roberto Bautista Agut. One of those responsible for moulding the curious young man bursting onto the world stage in front of our eyes is father and coach Apostolos. Speaking to Channel Nine's James Bracey, Apostolos perhaps unwittingly shed some light on where the philosophical side of his son came from. "Hopefully me as a father I create a good person for the society and if I succeed in that I feel complete as a person," he said. On that front he's breaking new ground as a tennis player to contribute something to the world. But where he's really making an impact is on the tennis court, where his courageous, swashbuckling style of play has already swept aside Federer and now puts him on the biggest stage against Nadal. Win that and a kid determined to break down boundaries will be one match away from history as the first player to win a grand slam title for Greece.